GENESIS, like beginning and creation of everything. Organic and natural shapes, rounded and smooth, characterized by a feminine minimalist style. 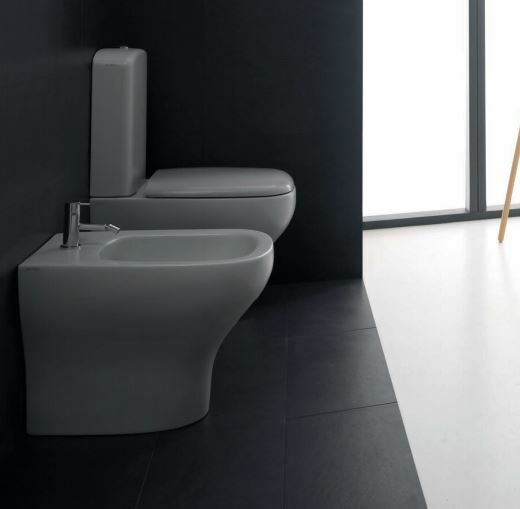 GENESIS offers an extremely wide range of basins, both in terms of dimensions and functionality, able to satisfy every specific demand: wall hung, semi-recessed and sit-on installation or on piece of furniture as well, also suitable for floor mounted and W/H pedestal, freestanding version and with washtub function. Both 70cm and 100cm basins can be provided with a specific towel-rail, with the same design inspiring the whole collection, available in the traditional chromium-plated finish as well as the new shiny white finish. Same peculiar design characterizes also the freestanding bathtub. 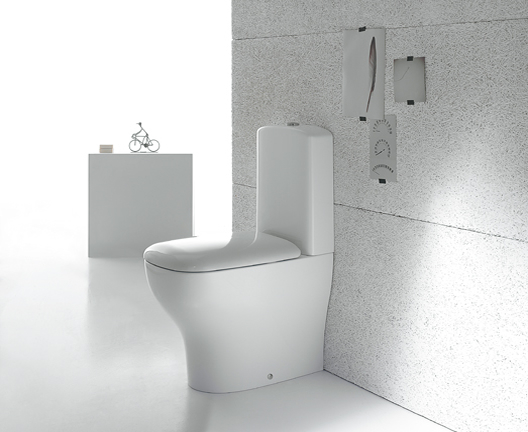 Wc as well as bidet are available both in wall hung and floor mounted version. GENESIS Collection represents the synthesis of a wide full and functional project, characterized by many different elements thought and developed following the original stylistic corse animating the entire series. Bathroom is where our days begin and finish, the perfect place for our well-being and body care. Daily collection is inspired by these everyday moments where anything is left to chance and its Wc, sanitary ware and accessories guide our life with functionality and beauty. This collection is characterized by soft and decisive shapes which make their use and every our action even more pleasant. Floor mounted WC with adjustable water inlet/outlet MULTI. Wall drain turning into floor drain by means of the PVC pipe supplied on demand. Back to wall installation. Drain 4,5 / 3 Lt. FISSAGGIOGHOST® fixing kit included. Available in any of the matt Globo colours. Pear 2 sanitary fittings pick up the unmistakeable design of the Pear models already in production, with an even more slender form. They are wall-mounted, all-white, or two-colour (RAL7021) to further emphasize their volume, creating an unusual visual effect. Wc cm 38 x 52,8d x 25,5h - 15" x 20" 3/4 x 10"
Is a project which includes basins, furniture, mirrors, wcs and bidets available in the floormounted and wall-hung versions. These items “move” between art and industrial product, giving a sense of perpetual creative flow. The thinness of the edges, together with a new kind of design, represents the motive of the collection. The basins lay on a wide and extremely clear surface with no tinsels and flutes. Each basin can be paired with a back-lighted and polished edge mirror, provided with a touch switch. 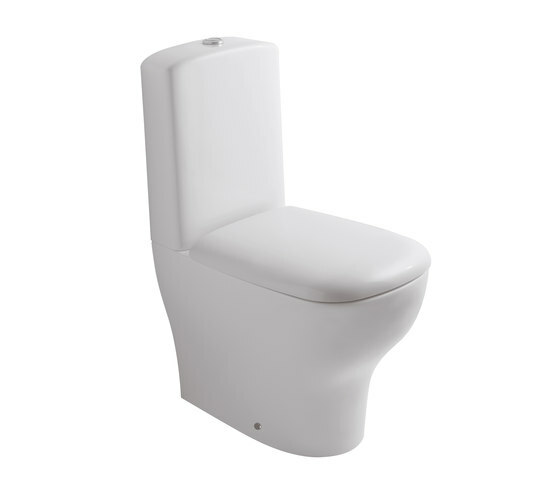 As to concern the oval shaped wcs and bidets, they are available in two versions: 55cm and 50 cm. 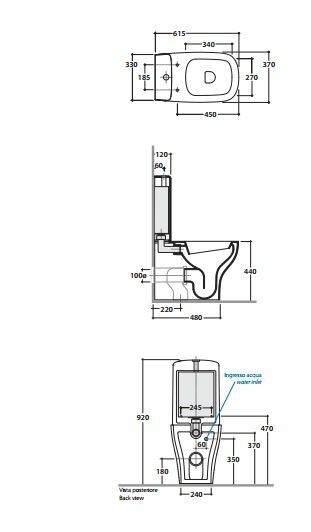 The floor mounted VASOMULTI® and BIDETMULTI® 55cm, matches perfectly with previous installations, by using different technical curves for the drain and pipe fitting for water load: a way to reduce the expenses for masonry-works. Floor mounted bidet one hole. Back to wall installation. Fixing kit included. Close couple pan with wall draining, turning into floor drain with the PVC pipe cod. VA079 supplied on demand. Drain 4,5 / 3 Lt. Fixing kit included.